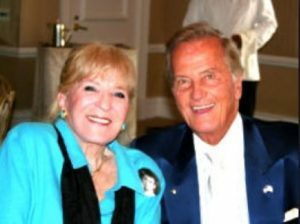 BEVERLY HILLS, CA (ANS – Jan. 13, 2019) —Shirley Boone, the wife of legendary entertainer Pat Boone, died Friday morning (Jan.11). She was 84. People Magazine reports she passed away at the Boone’s home in Beverly Hills, California. She had been suffering from vasculitis for less than a year. The Boones had been married for 65 years. As she passed from this life to the next, Shirley was surrounded by her husband and their four daughters, Cherry, Lindy, Debby, and Laury, who were by her bedside singing hymns to her, according to the magazine. CBN News reported in December that Shirley’s health was fading. Author and Christian minister Shawn Bolz said the Boones have been a force for God in the entertainment industry. Friends of the family have requested prayers for Pat and the Boone family. Susan Stafford, former host of Wheel of Fortune, said: “After a lifetime of dedication to her husband, Pat Boone, Shirley is now with the Lord she loved so much. With Pat and their 4 daughters at her bedside, she passed peacefully into Eternity today. People Magazine went on to report Shirley passed away peacefully on Friday morning at the pair’s home in Beverly Hills after suffering complications from vasculitis, which she had contracted less than a year ago. Following her death, Pat, 84, told PEOPLE that he intended to meet his longtime love again. Shirley was well-known for starting a billion-dollar Christian ministry. The couple’s Christian faith was also a contributing key factor in what drove their marriage to last for so long. INDIVISIBLE — One family … Under God.